HTC's latest flagship, the HTC One M9, is a high-end treat for smartphone users, but the company may also have a more reasonably priced alternative in the works. 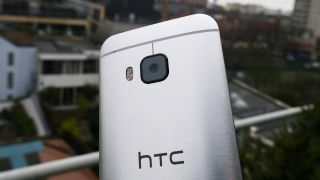 Like it did with the plastic HTC One E8 and the high-end One M8, HTC might release a slightly-less-than HTC One E9, according to some reports. This week the Chinese branch of Upleaks published what it expects to be the specs for the HTC One E9. According to the site the M9 alternative will sport a 2GHz MediaTek MT6795 64-bit processor, 3GB of memory, 32GB storage, a 20-megapixel rear camera, Boomsound speakers, and either a 4-megapixel UltraPixel or 13-megapixel front camera (possibly depending on region). A lot of these specs are similar or identical to the One M9's, but a few are definitely inferior. In addition the HTC One E9 will reportedly come in a dual SIM variant and in "white rose gold," "brown gold" and gray colors. HTC revealed the One M9 flagship at MWC 2015 this week, but we're still expecting to see a larger version called the HTC One M9 Plus at some point down the road, and the E9's announcement could accompany that.